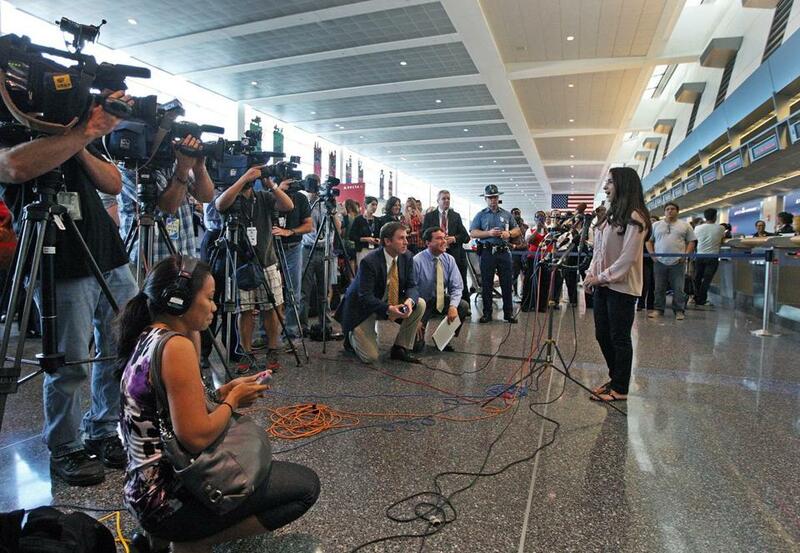 Aly Raisman addressed reporters at Logan International Airport after her arrival Wednesday afternoon. She vaulted her way into the hearts of Bay State residents. And now she has come home. 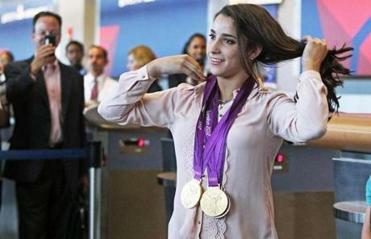 Olympic medal-winning gymnast Aly Raisman of Needham arrived at Logan Inter­national Airport Wednesday, met by dozens of journalists, family members, and fans. collared shirt and stylish skinny jeans, dozens of cameras clicked furiously as friends and fans rushed to greet her. Talia Chiarelli and April Baker, both 17, trained with ­Raisman at Brestyan’s American Gymnastics Club for the past six years, and traveled to the airport to greet their friend because they said Raisman had asked them to be there. Raisman said she is still getting used to her sudden fame, adding that she especially liked meeting celebrities like Jordin Sparks and Nicki Minaj in New York City this past week during an interview blitz with her US gymnastics teammates. She said she hopes to ­encourage other aspiring gymnasts. “I hope that we all ­inspired all those girls, because I used to be that little girl who watched them and wanted to be like them,” she said. One fan and aspiring gymnast drove from Winthrop to greet her idol at the terminal, waiting for almost an hour before Raisman arrived. Francesca Vigliotta, 14, clutched a magazine outlining the London Olympic athletes, with a bookmark placed on the page profiling Raisman. Yet as Raisman made the rounds to the friends she left behind over a month ago, Vigliotta strived to break through the crowd for a quick photo and autograph. “Hold on,” Raisman told her, hugging the last of her high school friends before making her way outside to the white stretch limousine waiting to take her home to Needham. Vigliotta followed her, tears streaming silently from her eyes as she watched her idol slip away. But a man stepped out of the limousine and beckoned Vigliotta to come over. Raisman stepped out, pausing to take a picture and sign Vigliotta’s magazine. And as the world-famous gymnast slipped back into the car, finally headed for her Needham home, her 14-year-old fan smiled.